This was immediately taken as evidence that the Fed would defer interest rate rises until no earlier than September and possibly into 2016. This adds to growing evidence that the US economy may be stalling, but many analysts are still clinging to the hope that disappointing figures are only weather-related. Gold rallied as much as $25 and silver by $0.56, before giving up all these gains by last night. The culprit is renewed dollar strength against a low-interest market background. 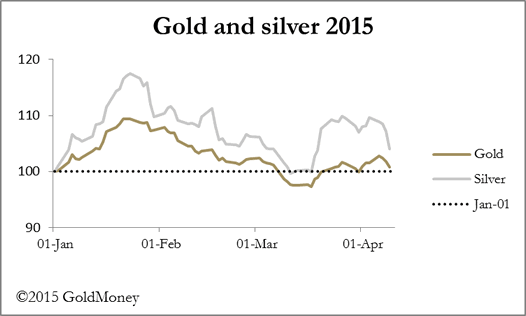 For much of the time gold and silver prices hardly moved, a sure sign of lack of interest in the futures markets. 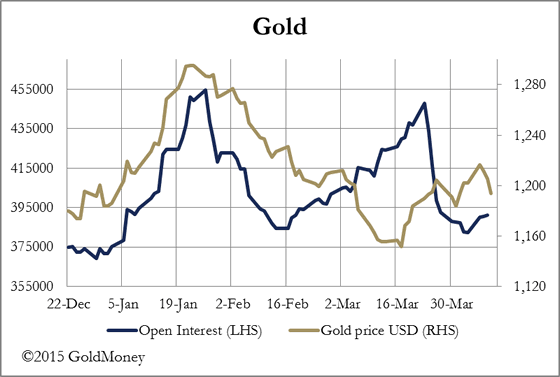 Volumes were predictably low, given the Easter break, and if our experience at GoldMoney is anything to go by small sellers predominate over small buyers. However, Open Interest in Comex futures has begun to pick up again in both metals, as shown in the two charts below. It is equally possible that the uptick in Open Interest is due to new bull or bear positions being opened. To determine which, the relationship between price and Open Interest will have to be watched carefully, as will movements in the US dollar. For now it should be noted that gold failed to overcome the $1220 level twice in a fortnight, so will have to do some work to absorb supply apparent at that level. 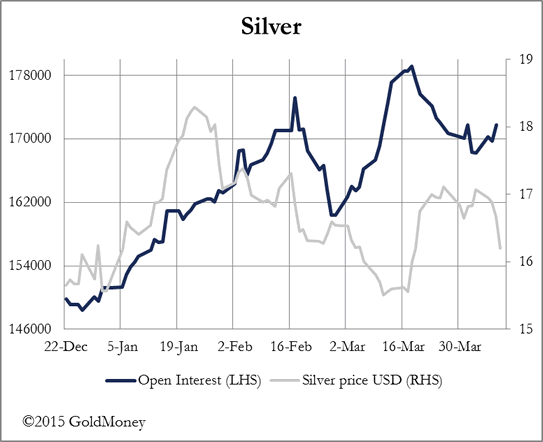 In silver's case the supply is established above $17.25. Prospects for next week are too close to call. One of the reasons behind dollar strength is euro weakness, stemming from uncertainties over Greece. Yesterday Greece paid back a €459m loan to the IMF, but there are serious questions now being asked about her finances from hereon. Unless Greece is bailed out again it seems inevitable she will default, but it is difficult for Germany, for example, to justify further funding when she believes that Greece has failed to stick to the contractual terms entered into by the last government. Germany also has her problems, with disappointing factory orders, giving more evidence of a global slow-down potentially affecting capital investment. Further confirmation of a slowdown in the Eurozone's engine could undermine the euro further. Monday. UK: British Retail Consortium (BRC) Retail Sales Monitor. Tuesday. UK: Consumer Price Index (CPI), Input Prices, Output Prices. Eurozone: Industrial Production. US: Producer Price Index (PPI), Retail Sales, Business Inventories. Wednesday. Japan: Capacity Utilisation, Industrial Production. Eurozone: Trade Balance, European Central Bank (ECB) Deposit Rate. US: Capacity Utilisation, Industrial Production, NAHB House Builders' Survey, Net Long-Term (Treasury International Capital) TICS Flows. Thursday. US: Building Permits, Housing Starts, Initial Claims. Friday. Japan: Consumer Confidence, Eurozone: Current Account, Harmonised Index of Consumer Prices (HICP). UK: Average Earnings, International Labour Organization (ILO) Unemployment Rate. US: CPI, Leading Indicator.